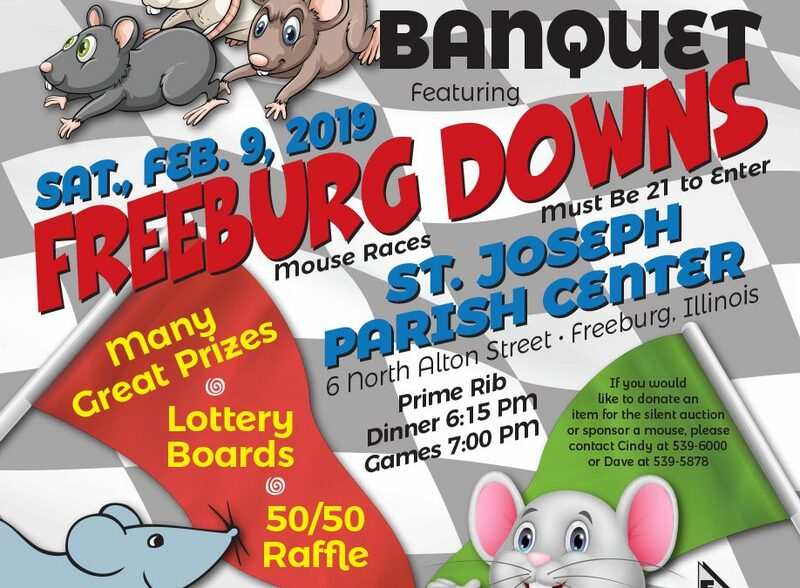 Freeburg Chamber Mouse Races Just Around the Corner! Mark your calendar for Saturday, February 9. The Freeburg Chamber is holding its Annual Banquet in the St. Joseph Parish Center. Like last year, this event will feature mouse races. Attendees are given tokens to bet on mouse races, and can purchase more if they wish. If your mouse wins, you can win more tokens which can be used for large raffle prizes at the end of the night. We will also have a 50/50 drawing, lottery boards, and many more great prizes. In addition to the mouse races, tickets also include a prime rib dinner (with chicken breast also available) and an open bar! Tickets are $40 per person or $300 for a table of eight. Tickets can only be purchased in advance by calling Cindy Niebruegge at 618-539-6000 or by visiting Citizens Community Bank, Niebruegge Insurance, or the Freeburg Village Hall. We also have sponsorship opportunities available. You can call Cindy at 618-539-6000 or Dave at 618-539-5878 to learn more about sponsoring a mouse or to donate to our silent auction.